Pictured above is a Stage 2 group that worked with a local walking club to restore the track up to the Crinoline. ALL BOOKINGS ARE NOW TO BE MADE ONLINE. BOOKINGS OPEN AT THE START OF THE TERM PRIOR TO THE PROGRAM. If you already have a CareMonkey account already please use this email to book onto the program. 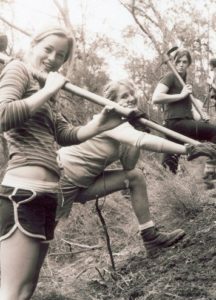 Stage Two is a unique opportunity for young people, who enjoyed their first Wollangarra experience, either in school groups or on a holiday program, to come back to Wollangarra, get their hands dirty, see some more amazing mountains and meet lots of other like-minded individuals. The program is slightly different to that of a Stage One. Firstly it runs for six days, rather than five and three of those nights are spent out camping. They may all camp together in one big group (maximum of 24 young people with four or five staff) or in two smaller groups (12 young people with 2 staff). This is a great opportunity to really get to know the other people on the program. Secondly, when Stage Twos go hiking it’s usually much shorter distances, as their purpose is to work on a project in the mountains, which often means carrying tools. These projects could be track work, rebuilding sections of an old high country hut or revegetation. This is all done with the assistance of Wollangarra staff members and sometimes professionals in the field (like Parks Victoria Rangers, stone masons or local walking club members). We also make sure that we have a rest day going for a wander up a river bed or up a mountain nearby.